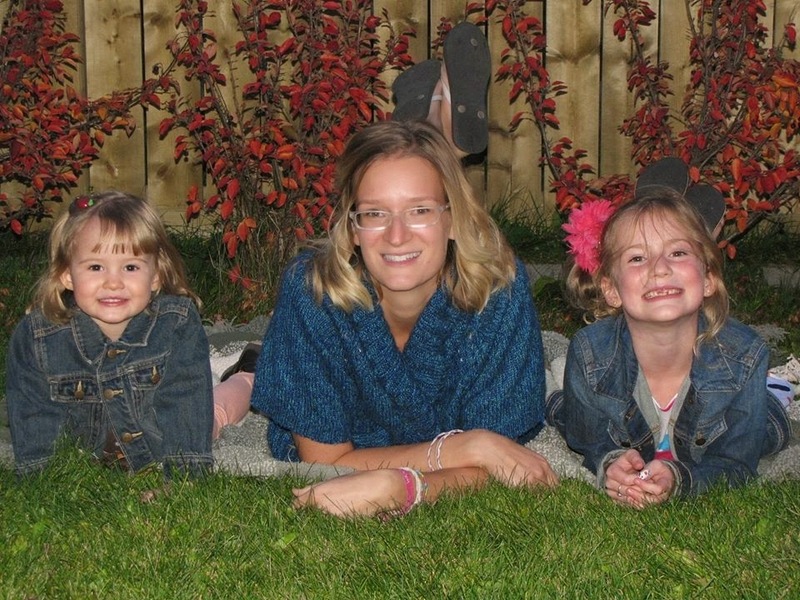 On November 24th my baby sister, Rayme, had a beautiful baby girl - after a very long and hard labour. She deserves a medal for all she went through! I am a very proud Auntie of new little Emily - and I think she's gorgeous!! (And, I finally downloaded the Pic, Tap, Go app (that I used to brighten this pic up) and love it! Can't believe I waited so long to get it!!) So, of course I needed to send Miss Emily some handmade gifts and thought I'd share them with you too! I had this cute quilt topper in my fabric stash and didn't even realize it had the same images that are in the Kate's ABC's Cricut cartridge! I cut lots of images from this adorable Kate's ABC's cartridge and Mod Podged them onto a canvas background covered with a background of patterned papers. The sunshine and clouds are from a Miss Kate Cuttables SVG download and I welded the diecut letters before cutting them out. After I glued all my images down I traced around them with a black pen and used some brown Distress Marker to watercolour in some shading. A bit of white gel pen and some stencilled glittery hearts add the finishing touch. My sister, Rayme, got our package the day before she went into labour. I'm happy to say both mom and baby are healthy and happy and we are so pleased to have another little member in our family! Thanks so much for stopping by today! I hope you're enjoying these last few days leading up to the big day. Hero Arts Layering Stamps - Two Ways! A couple months ago I won this awesome Color Layering Bird and Branch stamp from Scrap Shotz, an online scrapbook and card making supply company based in Calgary AB! I love these layering stamps and it was so fun to play with a couple colour combinations. I'll definitely be spending more time with these! These beautiful sequins in the Let's Be Mermaids Sequin collection from SpiegelMom Scraps matched my card perfectly! I layered the main stamped panel on the BoBunny Believe papers from the 6x6 paper pack. I love the 'mixed media' look of these papers! I love this sentiment that would make anyone feel perkier. For my second card I created a different look - going for a Christmassy feeling card. I really like the blues stamped together. I used the Holly Berries Sequin Mix from SpiegelMom Scraps for this card - this has been one of my favourite mixes to use this season! I added a layer of that awesome BoBunny paper, punched on top with a notebook punch and wrapped with twine before popping up my stamped panel. The cardbase is actually a silvery shiny paper, adding to the Holiday feel. 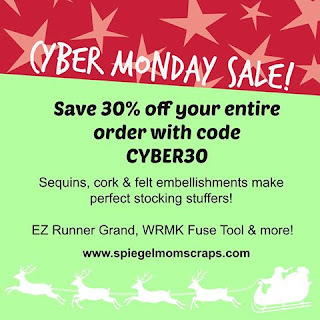 If you'd like to do a little Christmas Shopping and want to stop by the SpiegelMom Scraps Shop be sure to check out the coupon codes available at the SpiegelMom Scraps Blog with daily deals! Thanks so much for stopping by today! I hope you have an awesome, happy and crafty week! and I hope you're enjoying a Very Merry Holiday Season! 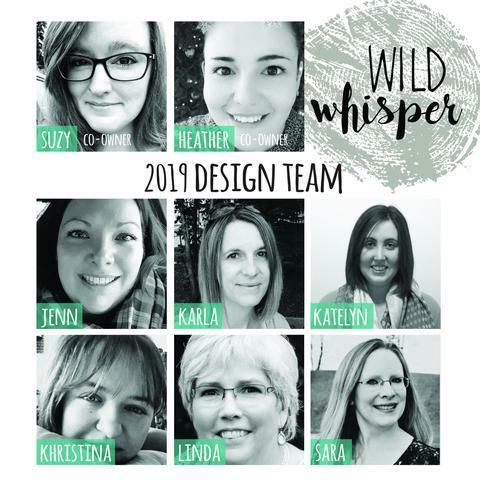 Kitty Bee Designs Challenge #86 - Christmas and VIDEO!! Hi Friends! I hope you've been having a lovely week so far! I've had lots of fun creating Christmas projects lately and here's one more for you! It's time for the midweek inspiration for Challenge #86 over at the Kitty Bee Designs Challenge Blog - Aloha Friday! 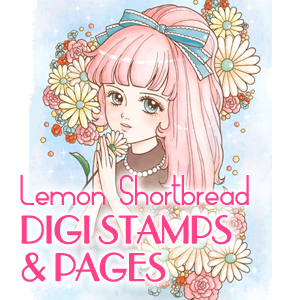 Lemon Shortbread and Scrap N'Dipity! For my project, I'm using the super sweet Kawaii Moose Girl digital stamp from Scrap 'N Dipity to create these adorable Christmas tags. I love to make a few really special tags to give out, and I had a tag swap that I was participating in, so I decided to make an assembly line and create 6 tags at once! I used a diecut background for the base of the tag and then layered over some Simple Stories Christmas bingo cards from a cut-apart sheet. I added some red ribbon bows, some diecuts stamped with a holiday sentiment, a punched border strip of patterned paper and some Holly Berries sequins from SpiegelMom Scraps! A bit of burlap string from the SpiegelMom Scraps Store and some pretty snowflake gems finish off these adorable tags! I made a process video where you can see how I coloured these little 'reindeer' and put together these tags. Check it here HERE or click on the link below. Mixed Media Christmas Tags and a Card! Hi friends! I hope you're all having a lovely week! I cannot believe we're into the second week of December. Of course I haven't got nearly everything done that I wanted to... But I did get a chance to make some pretty Mixed Media Christmas Tags! I created three different styles and a card at the end- so be sure to scroll down, and I'll share them all here together. For my first set I wanted to go with a blue, snowflake theme with a vintage look. For the first two sets I started off gathering a bunch of supplies together - some manilla tags, texture paste & a stencil, Distress Inks, Dylusions sprays and Perfect Pearls mist as well as some Christmas paper and wooden embellishments. I spritzed on some Dylusions Sprays and Perfect Pearls mist and added some texture paste stencilled snowflakes and layered Christmas papers. I had so much fun adding my wooden embellishments! I pushed them into some Versamark Embossing Ink and then poured on some Hammered Metal embossing powder from Emerald Creek. You're going to be addicted to this powder once you try it!! Of course, I had to add my favourite SpiegelMom Scraps sequins! I always add a tiny dot of Glossy Accents to adhere them. Then I tied on the seam binding ribbon that I coloured with Dylusions sprays. I love spritzing this white ribbon and then crinkling it up to dry. A bit of bakers twine adds a tie so it's ready to attach to the gift. Here are two more tags that I created using Distress Inks, patterned papers, washi tape and Christmas embellishments from my stash. I added some more pretty sequins from SpiegelMom Scraps in colours keeping with the vintagey feel. This Santa was fussy cut from a piece of Christmas paper and I added an older CTMH Christmas sentiment stamp directly onto my background. For the last two tags I tried some fun techniques on manilla tags using Glimmer Mist sprays, adding a little Gold Distress Paint and Stampendous embossing powder on the tag on the left and then using Emerald Creek Embossing powder on the right one. The Santa images are from a Kaisercraft Christmas collection and I popped them up on the backgrounds to add some dimension. These wonderful Rugged Steampunk Christmas Tree Charms from Emerald Creek look wonderful attached to some Burlap String from SpiegelMom Scraps with some Stickles added to the little impressions. I'm absolutely on love with the beautiful Holiday Style papers from Wild Whisper! I fussy cut some of the gorgeous images and a hand-lettered sentiment from these papers, adding some Glimmer Mist and Distress Inks and then popped them up with foam dots. I used some SpiegelMom Scraps Sequins (which you can also get from Wild Whisper now!! ), a cute tree brad and a jingle bell! And lastly, I put this card together! I was going to attach the tag to the card, but I decided at the last minute to create a different focal image and give the tag with the card so it could be used or hung on the tree as an ornament! I used the Charred Gold Emerald Creek embossing powder around the edge of this wonderful sentiment cut from the Holiday Style Wild Whisper paper pack - I love the way this embossing powder bubbles and creates several metallic shades mixed together!! I diecut the branches from a Sizzix die, and it reminded me of the image on the Holiday Style paper I used on the front of the card. I embossed the branches with the Fractured Ice Emerald Creek embossing powder to add a bit of glimmer, shimmer and texture. These awesome Gold Confetti and Gun Metal Grey SMS Sequins added the perfect glittery finishing touch! Thanks so much for stopping by today! I hope you're enjoying this festive season wherever you are! Remember to take time for yourself, slow down a bit and enjoy the days. Before we know it we will be into 2017! FCCB #291 - Merry Christmas! Happy Monday and welcome to another Monday challenge! This is our last challenge for 2016, so be sure to check back with us in January after the holidays. Challenge #291 - Christmas-create a card or project for Christmas. There will be 3 winners of $7 gift certificates! 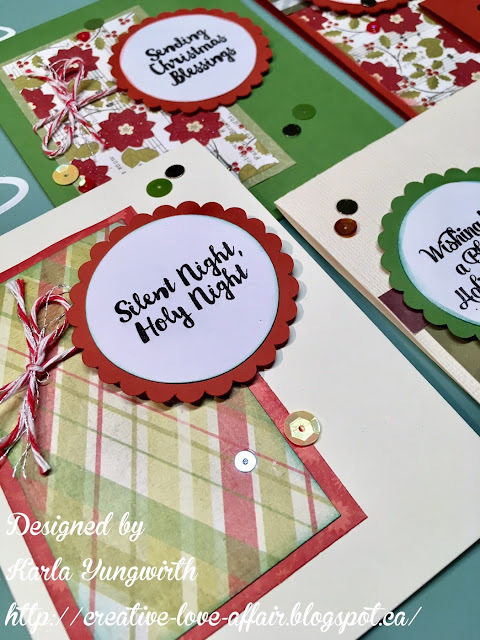 I love getting together with friends to make Christmas cards, and a week ago I had two lovely ladies over to make some cards using a One Sheet Wonder pattern from My Chic'n Scratch. She provides details on how to cut your papers to make all these cards and a cute folded box! 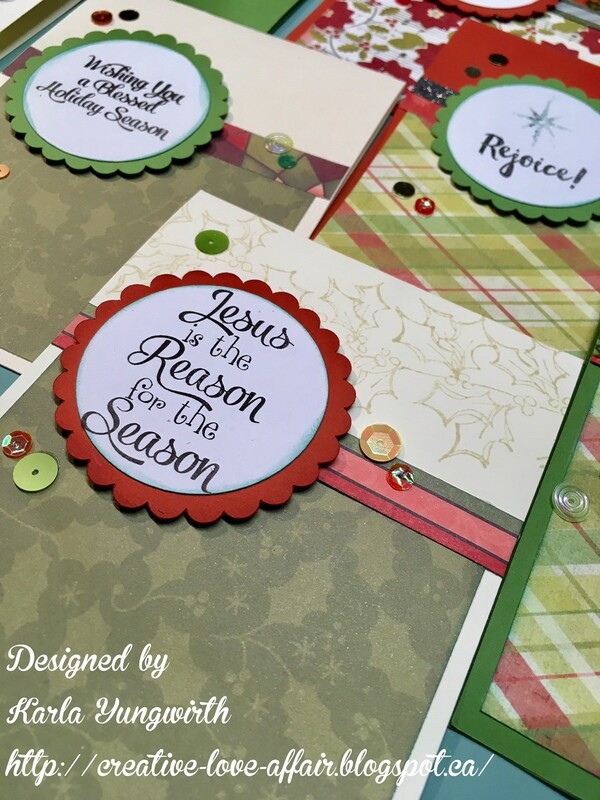 By using circle and scalloped circle diecuts from Cricut Craft Room Basic Shapes I created a focal cut to stamp my greetings on from the Nativity 1 and Nativity 2 stamp sets by Pretty Cute Stamps and used a Season's Greetings stamp my friend had from a set she got at Hobby Lobby. I added some Distress Ink shading around the edges of my circle cuts before layering them on the scalloped circles. Then I popped up the stamped circle with foam dots. Some pretty sequins from the SpiegelMom Scraps store decorate the front of my card - adding a bit of Christmas bling! I am trying to use up the Christmas papers I have on hand this year, and this was the perfect project for this! 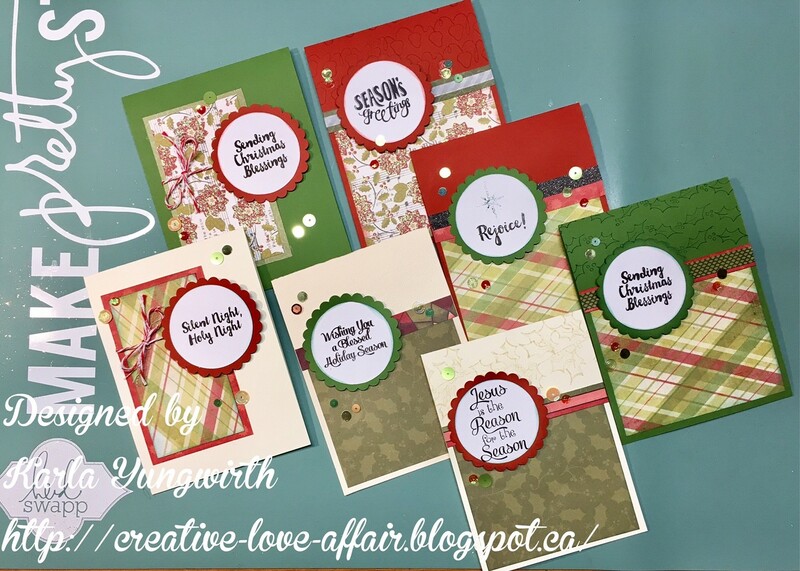 I was able to use some papers from an older CTMH collection as well as some from my favourite Heidi Swapp Believe paper pack. This was such a nice project to work on together. I was easily able to cut the pieces for myself and my friends and we all had a wonderful, crafty day! Thanks so much for joining me today! I hope you're enjoying these weeks leading up to Christmas and not stressing too much. When I start feeling overwhelmed I just remember the real reason for the season, and suddenly it doesn't seem as important to fit everything in, buy that extra present or spend more than I should on holiday shopping. ❤️️ Be sure to head over to the Fantabulous Cricut Blog to see all the other lovely projects our Design Team has come up with - and enter your own for a chance to win an awesome prize! With Sugar On Top Scrapbook Layout! I hope all my US friends had a wonderful Thanksgiving Weekend! I had lots of fun playing in the 15 Minutes 2 Scrap with SpiegelMom Scraps this weekend. 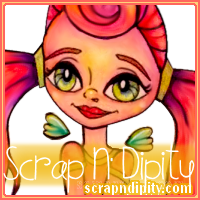 It is such a great community of creative, crafty girls, and one worth checking out! 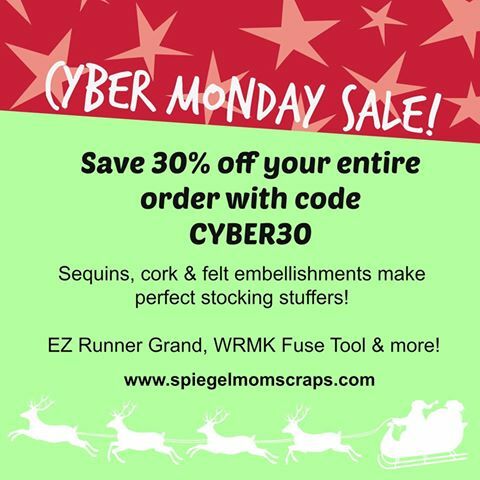 There were some awesome challenges and lots of inspiration going on as well as some great sales over at the SpiegelMom Scraps Store! I'll post a code below for the Cyber Monday Sale! One of the challenges was to create an 8 1/2 x 11 layout using gold letters, a stencil, and mixed media. 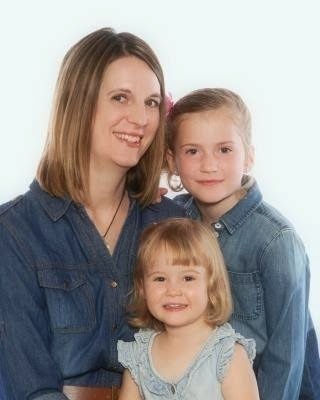 This was a bit of a challenge since I'm a 12 x 12 scrapbooker! But it was definitely fun, and I love how it turned out. 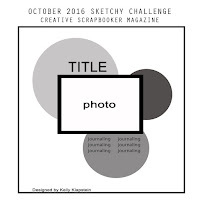 I started off using a sketch from the October Sketchy Challenge on the Creative Scrapbooker Magazine website and adapted it to fit my page. Using an off white background I stenciled white snowflakes using a Dina Wakley stencil and white Ranger texture paste in three different clusters on my page and then splattered some pretty Christmas coloured mists on my page using Tattered Angels Mists in Sage and Wild Currant along with some Tim Holtz Mica Mist. I also used the Glimmer Mists to colour in the seam binding ribbon on my journaling tag. I used the gumdrop stamps from the Pretty Cute Stamps Gingerbread House clear stamp set on some white cardstock that I had misted with the Glimmer Mists, as well as a couple sentiments - one stamped directly onto my photo. The diecuts are from the Winter Frolic Cricut cartridge, which was a free cut of the week. I created three distinct clustered areas on my layout with the stenciled areas, diecuts, stamps and sequins to create a visual triangle around my photos. For the gold lettering element, I used Emerald Creek Charred Gold embossing powder on my diecut letters. This embossing powder is fantastic! I love the gold with pops of black in it. I was so excited to recently pick up this embossing powder, Gold Confetti SpiegelMom Scraps sequins and amazing Holiday Style patterned papers from the new Canadian Wild Whisper Shop, and to use all these wonderful goodies on my layout! I had lots of fun using these pretty papers on my diecut images and fussy cutting out the pretty stars from one of the papers. I even added a bit of sugary Stickles to my letters for some extra detail. Thanks so much for stopping by today! As December approaches we're looking forward to doing lots of Christmas activities and enjoying a happy Holiday season once again. I hope you had a wonderful weekend and have a creative and joyful week ahead! Hi Crafty Friends!! I'm back today to share a couple of cute Christmas Cards I made using the adorable Special Delivery Red Panda Valentine Digital Stamp from Kitty Bee Designs. Even though this cutie is technically a Valentine stamp he could definitely be used for any type of Happy Mail! He was so sweet, I decided to colour up two and make a pair of similar layered cards. I started off layering some patterned papers over prefolded card bases and using some Simple Stories Christmas journaling cards as a background layer. 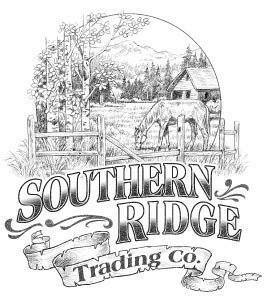 I then added the red deer sticker and added some hand drawn stitching lines using a black Smash pen. I used Prismacolor and Hobby Colour Markers to colour in the Red Panda image. Whenever I'm not quite sure of exactly what colours to use when colouring in an image I just 'google' what I'm looking for as a cartoon and I can usually get an idea of how to colour it. I added an ornament sticker over top of my popped up image and used some foam tape to give the top of it a bit of dimension. I added little bows to the top of the ornaments, glued in place with tacky glue. I used sequins to finish off my cards - one of my favourite tricks to embellish with these days - from the Holly Berries, Wedding Bells and Gold Confetti Sequin Mixes from the SpiegelMom Scraps Store. 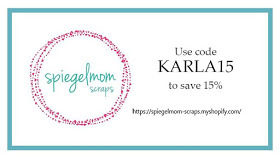 You can pick up your own awesome embellishments at the store using the code LISA15 to save 15%! If you're in Canada, you'll definitely want to check out the SMS Sequins that are available at the Wild Whisper Shop! This beautiful plaid paper that I've used as a background is from their Holiday Style collection and it is gorgeous! Thanks so much for stopping by today! I hope you are getting some crafty time to make some holiday cards. 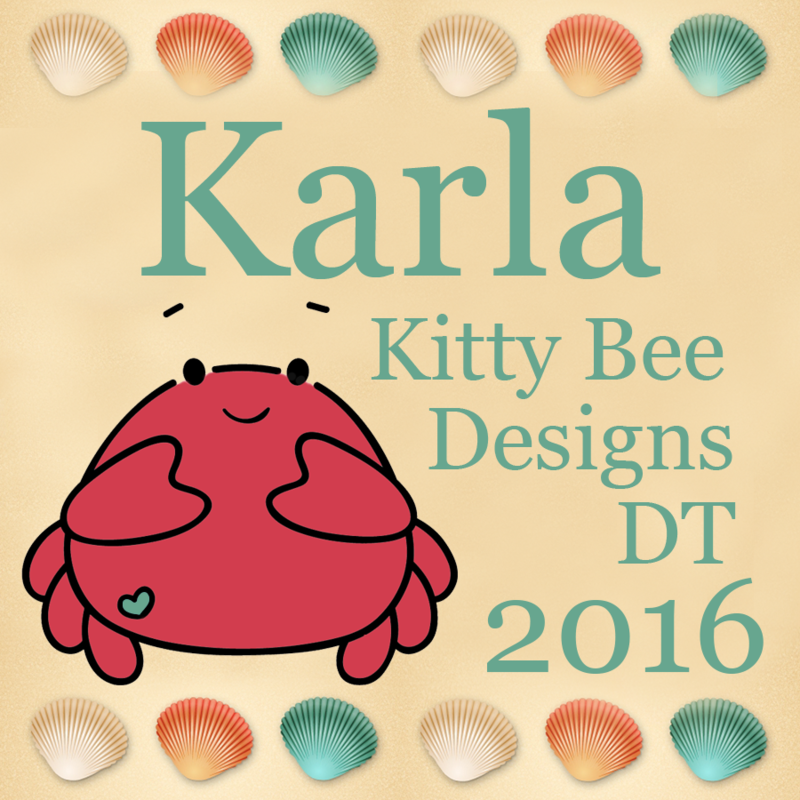 Be sure to check out the Kitty Bee Designs Etsy store for this and other super cute stamp designs, and have a wonderful week!